Nero was born Lucius Domitius Ahenobarbus in Antium, the son of Gnaeus Domitius Ahenobarbus and Agripinna the younger in 37 A.D. . Nero's father died when he was about three years old. His mother later married her uncle, the emperor Claudius, in 49 A.D. . In his new position in the imperial court, he was given a strong education. Agripinna used her persuasive powers to get Claudius to adopt her son, giving him a position in the line of succession. His name at this point was changed to Nero Claudius Drusus Germanicus. When Claudius died in 54 A.D., Agripinna sought the support of the praetorian guard for the elevation of Nero to the throne. She found it in the person of Sextus Afranius Burrus, a praetorian prefect. Nero became emperor at age 16. 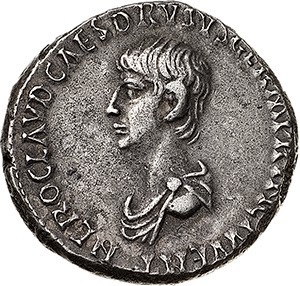 Early coinage of Nero shows a very childlike portrait of the emperor. 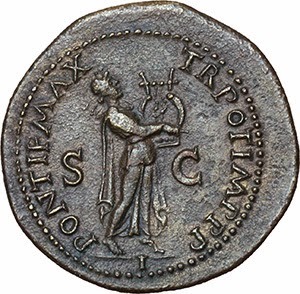 Agripinna became his regent, and as such was the first female ruler of Rome in Nero's place. This power was soon taken from her by her son, who quickly pushed her out of the limelight. Nero's reign started with stable administration by his advisers, and he initially granted the senate the power to exercise their office, unlike during the reign of Claudius. An interesting, but short lived action he took was to ban the killing of gladiators and prisoners in public exhibitions. This did not set well with the public. They wanted blood. There were protests and minor rioting, which caused the reversal of the policy. Agripinna vocally protested Nero's love and patronage of the arts, along with his taste for Greek culture and manorisms. In response to her criticisms, Nero had his mother killed, which met with approval of many of those in the government who despised her. Nero's interest in the arts, especially the performing arts, began to gain him public ridicule. He sang, acted, and danced on the public stage before audiences, and he forced the senators to attend his performances, which needless to say, did not set well with them. He also authored plays and music for public performance. He even went so far as to depict himself on coins as Apollo playing the lyre. His excesses included the building of the largest palace ever built by a European monarch, even to this day, the Golden Palace of Nero. The great fire of Rome was blamed on Nero by many as a means for him to acquire land on which to build the palace. 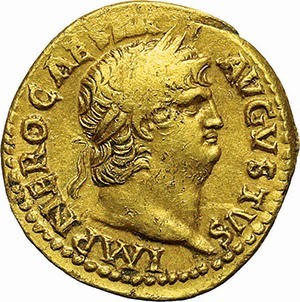 Protests over the emperor's excesses prompted the enforcement of anti-treason laws, especially against early Christians, who Nero blamed for the fires. Mass executions ensued, including the killings of Saints Peter and Paul. Food shortages and political unrest stirred further resentment when Nero went to Greece to collect and study art, as well as to publicly perform. By the time he returned to Rome, the political scales had forever turned against him. The senate had ordered his arrest, and sentenced him to death by flogging. Nero learned of his sentence, and fearing the spectacle and outcome that would ensue, committed suicide by stabbing himself in the throat. 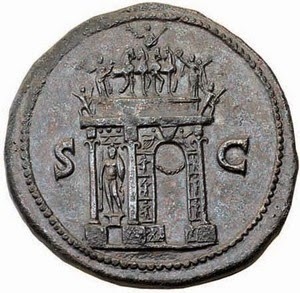 Roman medallic artistry reached its greatest height of execution in the coinage of Nero. 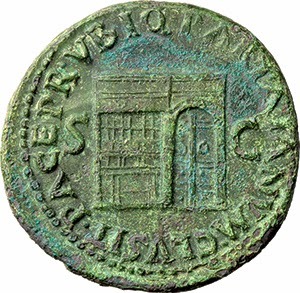 A golden era of portraiture began with his coinage, and artistry on the reverses of his coinage include one of the greatest masterpieces of all Roman coinage, that being the sestertius issued for the opening of the Port of Ostia. Reverses showing from seven to thirteen ships in the port even include sailors on the decks of the ships. Other splendid reverse images include the Temple of Janus with its doors closed, signifying peace throughout the whole empire. 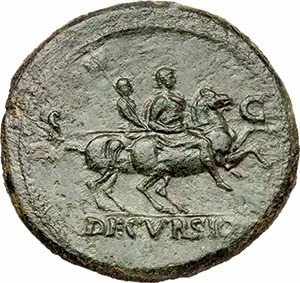 The emperor's virtues are extolled in images of him as a soldier riding a horse, with the legend Decursio, Nero playing the lyre, and an image of Nero's triumphal arch. His coinage was not all self-promoting, however. 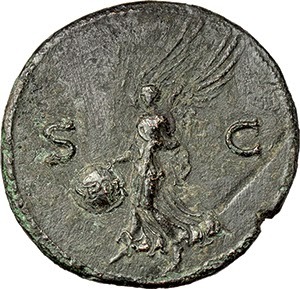 A very popular and profuse coinage shows a reverse depicting Victory advancing, carrying a shield bearing the initials SPQR. 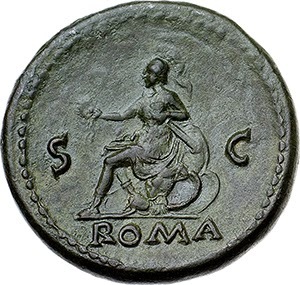 There was also coinage giving honor to the state, depicting the seated figure of Roma in great style. 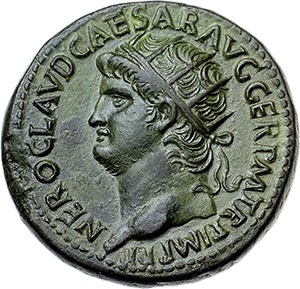 The bronze issues of Nero tend to show exceptional detail and realistic imagery, and are widely collected.